Jorge Amaral and Mia Pomerantz-Amaral formed Duo Amaral in 2008 and were soon established in the international guitar scene, garnering high accolades from the media and from devoted audiences. During a tour in Italy, their recital was described in Il Messaggero Veneto as “masterful, with poetic virtuosity and intensity of expression”. 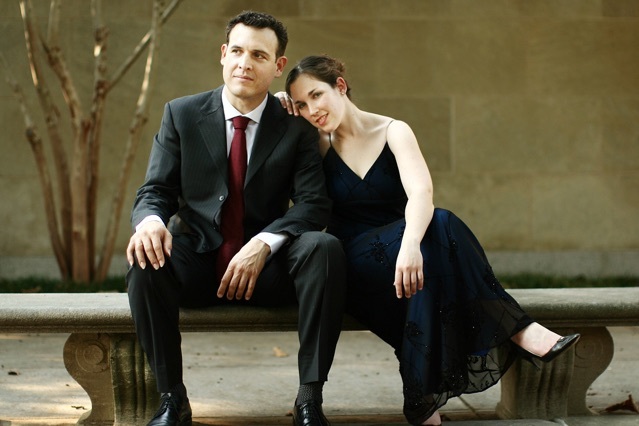 Mike Telin of ClevelandClassical.com, described the duo as "superb, thoughtful musicians". Their debut album 'Súplica' was released in 2011, featuring the title work: a world-premier composition written by Mr. Amaral's father, Victor Manuel Amaral Ramirez. Céline Keating of Minor 7th Magazine described the CD as “...a sublime album of classical music for two guitars...”. Their Second album 'Textura' was released in 2013 and includes several of their own arrangements. Al Kunze of Soundboard Magazine describes: “Duo Amaral’s Textura is a superb disc, featuring beautiful music, exquisite playing, and exemplary recording. Mia Pomerantz-Amaral and Jorge Amaral play with extraordinary precision allied with delicacy, nuance, and virtuosity in equal measures.” (March 2014). And Bradford Werner of This is Classical Guitar continues: Textura “…deliver[s] some of the best ensemble work, musical expression, and repertoire. Another great album release!… One of the premier classical guitar duos of today!" Their latest album ‘Key West’ was released in March of 2017 and features an all Latin-American program including the world premier of ‘Key West Suite’, dedicated to the duo. Classical Guitar Magazine described the CD as “… a knockout - brimming with sensational, synchronous playing on a lively and challenging set of modern pieces… outstanding duo”. The Amarals completed their studies at the renowned Peabody Conservatory of Music of the Johns Hopkins University in Baltimore, Maryland where they both were awarded Master of Music and Graduate Performance Degrees under the tutelage of Manuel Barrueco, Julian Gray and Ray Chester. They have toured in Italy, Germany, France, Switzerland, Poland, Panama, Mexico, Israel, Cyprus and the USA, as performers and jurors, also offering workshops and masterclasses. Ms. Pomerantz-Amaral began her studies at the Rubin Academy of Music in Jerusalem, Israel, studying with Irit Even-Tov. She has won the Top Prize at Guitar Gems International Competition in Natanya, Israel, Second Prize at the 38th Fernando Sor International Competition in Rome, Italy as well as the special prize winner of ‘Best Interpretation of a Piece by Sor’. She also received a scholarship from the Keren Sharett American-Israeli Foundation Scholarship. Finalist and prize winner is several competitions as well, Jorge Amaral graduated with his BM and MM from the Santa Cecilia Conservatory in Rome under the tutelage of Giuliano Balestra. He was the First Prize winner of the 29th Fernando Sor International Competition in Rome as well receiving the prize for Best Interpretation of a Piece by Sor that year. Duo Amaral founded the Baldwin Wallace International Guitar Festival and Competition (2012) as well as the Federal Hill International Guitar Series (2014) Their contribution to the guitar duo repertoire includes transcriptions and commissioning of new compositions, to be performed and incorporated into the classical guitar canon. Devoted teachers, many of their students have placed as top prize winners for the past ten consecutive years in some of the most prestigious national and international guitar competitions in the USA such as the Guitar Foundation of America, the Beatty Competition in DC and others. Their students were also selected to perform in Carnegie Hall in NY and open concerts for David Russell and others as part of the Marlow Guitar Series.